This past Monday Ysolda Teague started her second Mystery KAL and at the last minute I decided to join in! This will just slightly overlap the very first of Loopy Academy Spring Semester, but I think it will be OK. I didn’t do the first one, last year, but the finished projects looked fun and I like the idea of picking my own mystery. The way Ysolda does it, each clue has two parts: A and B. 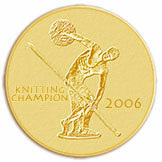 You knit one of those. Then the next week you pick and so on. There are apparently 32 different possibilities for finished projects depending on your combination of A’s and B’s. I think organizing something like this might make my head explode, but I also think it will be fun to participate. I decided to stash dive for this, since I was signing up the day before it started. I pulled several options, some single color, one two color and one three color possibility, but in the end I settled on using a single color of Madelinetosh Pashmina which had enough yardage. It was originally Silver Fox, but I was afraid the color was too pale and would make me look washed out, so I over dyed it a rich ultramarine blue. It’s been sitting in my stash waiting for me to make up my mind what to do with it ever since. This seemed like a good idea. Not knowing the direction the pattern is taking might drive me nuts with using multiple colors, so a single color was probably my best choice. On Monday the KAL started and the first clue was released. I chose to knit the A version. I’ve got a picture below, but if you don’t want to see it, don’t scroll down. 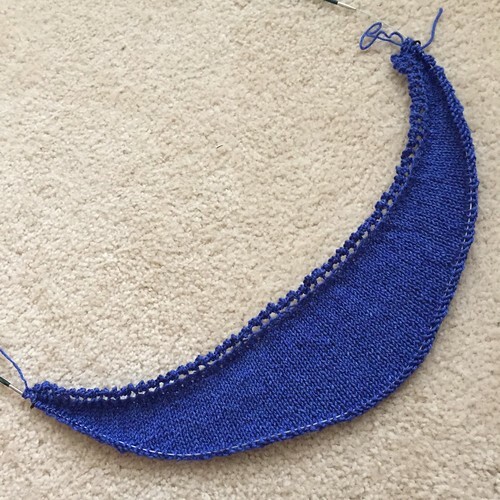 While you’re deciding if you want to scroll down or not, I thought I’d save us all some time because every time I mention a KAL, someone asks if I’m going to do another Mystery Shawl: I’m not planning on it anytime soon. It’s probably safe to say it won’t happen while I’m homeschooling Caleb. Mystery shawls just take too much time that I don’t have right now. He’s in 8th grade now. He’ll graduate homeschool and head to college after 12th grade so I’ll revisit the idea then. OK, did everyone who doesn’t want to see stop scrolling down? Good! When I knit a shawl with Pashmina I was disappointed in how stiff it seemed. Is it just me or was I working at too tight a gauge? (it didn't seem tight) What size needles are you using?